skip your lunch, not your wine! It’s that time of year! 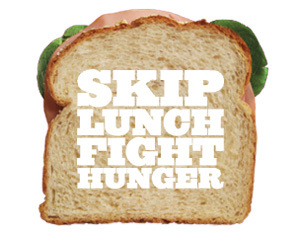 Once again, Team Grapefriend takes a little break from the grapes to raise funds for Skip Lunch Fight Hunger, City Harvest’s annual campaign that asks people to donate what they normally spend on lunch to help feed New York’s hungry children and their families. During the summer, access to free school meals may become limited, making it tough for families who already struggle to put food on the table. One big bummer: Fred’s isn’t doing guest bartending for charity anymore so I can’t raise funds through that which was super fun. I’d much rather raise funds while raising a glass, but for now this is my only way! If you’d like to help spread the word and raise funds as part of the team, just let me know. Tags: charity, city harvest, food, sandwich, skip lunch, wine. Bookmark the permalink.